Jay Powell sold a rate hike and hawkish economic outlook with dovish language at his first policy meeting. The central bank is divided over how low unemployment can go and whether tax cuts will spark inflation. The chair’s confident showing may buy time to resolve the tensions. Gulf states, Hong Kong and others that peg their currency to the dollar worry that copying Fed moves will dent growth. But with five more hikes expected by the end of 2019, not doing so risks the ire of financial markets. It's a tricky dance that even China may be dragged into. Measures of how much asset prices are expected to gyrate have risen from ultralow levels. But investment strategies that worked a decade ago may not now. Volatility can now lead, not just follow asset prices and old market relationships may break down when turmoil hits. 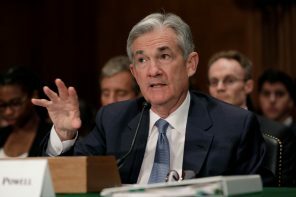 The new Fed chair deftly handled his first congressional testimony since taking office, giving few indications he is itching to tighten faster. If anything, his political nous and a friendly Republican majority might give the central bank more room to run the U.S. economy hot. Higher wages, inflation fears and the prospect of faster than expected rate hikes are posing challenges market players haven’t seen for years. Comcast may spike Walt Disney’s potion to acquire Rupert Murdoch’s entertainment assets. Plus, Singapore’s airshow has everyone buzzing. From Mumbai to Milan, we polled participants at our Predictions 2018 summits. Even before last week's rout, most thought investors are too exuberant, bitcoin is a bubble and Donald Trump is doing poorly. More surprising were regional takes on NAFTA, Italian elections and Brexit. U.S. Treasury yields rose to near four-year highs even as the Fed left policy unchanged at Janet Yellen’s last meeting. A fresh growth spurt and worsening deficit outlook pose challenges for successor Jerome Powell. Hiking in a rising-rate environment is riskier for the economy. Some U.S. rate-setters wonder about their 2 percent goal – both its level and whether it’s more a ceiling or a long-term average. The debate is welcome but could be even more radical. Today’s real issue is whether central bankers can fully explain, let alone control, inflation. Industrial staff in Europe’s biggest economy are striking for higher pay. They may, however, trim wage demands in return for flexible working. If pay pressures fail to flare in such a tight labour market, the European Central Bank can hardly count on them surfacing elsewhere. December’s relatively weak jobs and wage growth gives policymakers a breather. But with 2.1 mln positions created in 2017 and unemployment historically low, long-awaited pay increases - along with new tax cuts - could soon start stoking inflation. That would force the Fed’s hand. With her fifth and final rate hike, the Fed boss has put monetary policy on a path to normalization without spooking markets or hurting growth. Her successor may not be so fortunate. As the central bank gauges potential tax cuts and trade wars, its moves become less predictable. Seoul’s first increase in benchmark borrowing costs for more than six years is a prudent step toward normalising monetary policy, given signs of economic strength. But crushing consumer debt and a housing slowdown mean the central bank must tread carefully. The outgoing Fed boss warned of growing deficit risks just as lawmakers weigh tax cuts that would exacerbate it. It’s also up to politicians to improve education, investment and infrastructure spending. Her message of central bank limitations is one her successor will echo. A drop in trading profit failed to do much damage at the French bank, which reported an impressive 11.6 pct return on tangible equity in the third quarter. Beating its own return targets, even though they’re modest, should help dispel perennial questions over BNP’s capital level. Ignazio Visco has been reappointed as central bank governor despite political opposition. His first challenge is to quell critics of his handling of Italy’s banking crisis. EU rules are also getting tougher and Mario Draghi’s departure from the ECB in 2019 will remove an ally. In addition to the Stanford economist's dogmatic bent for a programmatic monetary policy, John Taylor backs bigger regulatory changes than others in the running to be the next U.S. central bank chief. His laissez-faire ideas about policing Wall Street are loaded with risk. British inflation has hit 3 percent, the highest level since 2012. No wonder the Bank of England chief is hinting policy rates may soon rise. Carney’s problem is that he will be criticised for hurting a slow-growing economy if he hikes and accused of inconsistency if he delays.